Thalgo Anti-Aging Foundation gives a glow for a natural-looking result in every light. 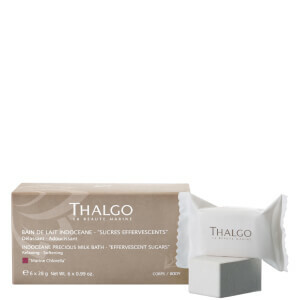 Its anti-aging action meets the needs of mature skin making it gradually appear firmer, smoother and velvety-soft. Its indulgent texture, rich in redensifying marine silicium and hyaluronic acid complemented by radiance-enhancing pigments, provides an optical correction of wrinkles and other skin imperfections. The complexion appears flawless and the skin remains smooth all day long. Shake before use. Gently warm the foundation in the hands. Apply on the forehead, cheeks and neck. “Stretch” the foundation, working from the middle of the face outwards using slightly upward motions. For areas with more pronounced imperfections, apply an extra dab of foundation and gently pat in. Remove make-up at the end of the day. Shake before use. Gently warm the foundation in the hands. Apply on the forehead, cheeks and neck. "Stretch" the foundation, working from the middle of the face outwards using slightly upward motions. For areas with more pronounced imperfections, apply an extra dab of foundation and gently pat in. Remove make-up at the end of the day. Aqua (Water). Cyclopentasiloxane. Butylene Glycol. Glycerin. Propylene Glycol Dicaprylate/Dicaprate. Dimethicone/Vinyl Dimethicone Crosspolymer. C30-45 Alkyl Methicone. Cyclohexasiloxane. C30-45 Olefin. PEG/PPG-18/18 Dimethicone. Sodium Citrate. Polymethylsilsesquioxane. Caprylic/Capric Triglyceride. HDI/Trimethylol Hexyllactone Crosspolymer. Sodium Chloride. Dimethicone. Phenoxyethanol. Tocopherol. Parfum (Fragrance). Cyclotetrasiloxane. Chlorphenesin. Hyaluronic Acid. Silanetriol. Methylsilanol Mannuronate. Stearalkonium Hectorite. Glycine Soja (Soybean) Oil. Sodium Phytate. Disodium Stearoyl Glutamate. Propylene Carbonate. Sorbitol. Lecithin. Xanthan Gum. Caprylyl Glycol. Alcohol. Citric Acid. Sorbic Acid. Diatomaceous Earth (Solum Diatomeae). Glyceryl Caprylate. Phenylpropanol. Benzyl Salicylate. Alpha-Isomethyl Ionone. Citronellol. Limonene. Linalool. (+/-) May Contain: CI 77891 (Titanium Dioxide). CI 77492 (Iron Oxides). CI 77491 (Iron Oxides). CI 77499 (Iron Oxides). Aluminum Hydroxide.